They’re ess-cinch-tial! Paper bag pants (a.k.a. 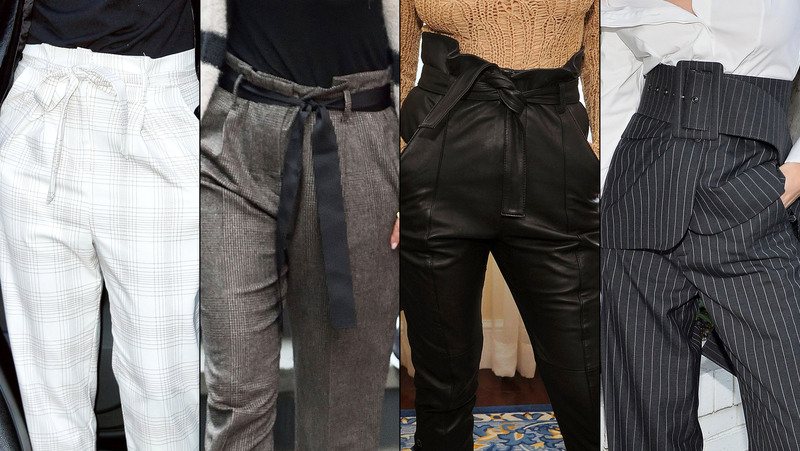 bottoms that scrunch at the waist) have become a wardrobe staple for movers and shakers like Jennifer Lopez, Gabrielle Union and more. Not only are they a great way to keep warm during these colder months, but the pants’ versatile shape allow wearability throughout the day and night. Keep scrolling to see how the stars style theirs! What is that, velvet? Gabrielle Union mixed and matched her materials for a day of press in New York City on January 11. The Being Mary Jane star, 44, tucked a black Vince turtleneck into the Asos Check Pant With Paperbag Waist (on sale for $30.50! ), teaming the look with a black velvet blazer by The Row and burgundy platform Schultz shoes. Nice and cozy! Jennifer Lopez bundled up in a Brunello Cucinelli Alpaca, Wool, Cashmere and Silk Striped Cardigan with Lurex, Plaid Belted Cropped Trousers and suede Giuseppe Zanotti booties on October 4, 2016, in New York City. For a visit to Amazon’s Style Code Live in Westlake Village, California, on November 4, 2016, Kourtney Kardashian tucked a camel-colored cable-knit sweater into a pair of black leather pants paired with black pumps. Rosie Huntington-Whiteley, 29, showed some shoulder in a strategically unbuttoned top at the CFDA/Vogue Fashion Fund Fashion Show and Tea in Los Angeles on October 26, 2016. The Mad Max actress modeled a solid white Monse shirt tucked into a pair of high-waisted pinstriped pants with a wide belt and navy blue pumps.